Bactrian camels are among the few animals native to the Gobi desert, where wildly fluctuating temperatures, scarce supplies of food and water, and rugged terrain create a challenging environment. Pads on their knees protect their skin while they kneel on the rocky ground. Long eyelashes and closeable nostrils protect their eyes and lungs from blowing sand. Bactrian camels eat almost any kind of plant they find in their native habitat. They will also eat meat and fish if they have no choice. Their humps store fat, allowing them to survive with little food for extended periods of time. Special blood cells store fluids to keep them healthy even when they are dehydrated. When they do find water, they can drink 15 gallons at a time. The arid, rugged nature of the desert makes it difficult for other animals to live there. As a result, Bactrian camels have relatively few competitors or predators. This—along with their many adaptations to dry, harsh habitat that allow them to obtain the food and water they need and protect themselves from wind, heat, and cold—makes it possible for the camels to survive. Bactrian camels spend their time in groups of up to six animals, meandering through the desert in search of food and water. People long-ago tamed camels to carry people and baggage on journeys through the desert. Domesticated Bactrian camels, raised by people for their labor, are quite common in the desert. Their genetically distinct wild cousins are critically endangered due to habitat loss and interbreeding with domesticated camels. The word camel is thought to have derived from the Arabic term jamala, which means to bear. Camels are close relatives of llamas and evolved in North America. They migrated to Asia about 2 million years ago. In addition to being beasts of burden, camels also supply milk, meat, wool and hides. Their dung is used as fuel. Bactrian camels are called “ships of the desert” because when they walk, they move front and back legs on the same side of the body at the same time, creating a rolling motion like a ship at sea. Spitting, kicking, and biting are typical offensive and defensive behavior, especially during breeding season. People use camels not only for transportation, but also as a source of meat, milk, wool, and hides. The dried dung makes good fuel. In summer Bactrian camels cool themselves by facing the wind. In the winter they kneel or crouch with their backs to the cold winds. Scientists think that at least some of the remaining wild Bactrian camels are actually descended from tame domestic camels that escaped or were released. The wild Bactrian camel is listed as Critically Endangered by the IUCN. Its greatest threats are habitat degradation, interbreeding with domestic Bactrian camels, and human exploitation. Some 350 wild Bactrian camels live in the Mongolian Great Gobi Reserve A south of Bayan Toroi, and approximately 650 additional camels live in three isolated and separated pockets in Xinjiang Province in China. In the Mongolian Gobi the main enemy is the wolf, but in China hunters and illegal miners are threats. In the Chinese Gashun Gobi there is no fresh water and this former nuclear test site holds herds of wild camels that have not only adapted to drinking saltwater, but also survived more than 43 atmospheric nuclear tests. 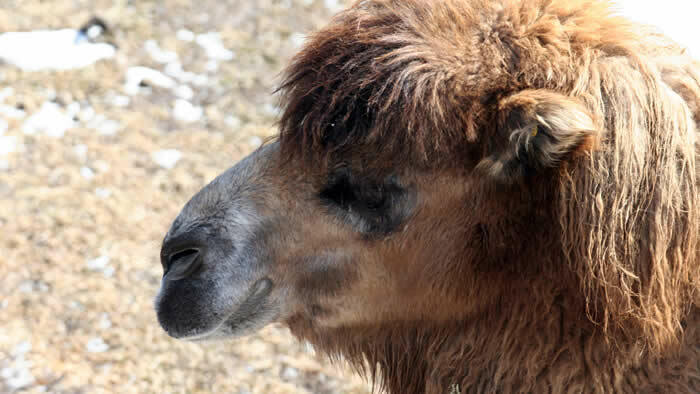 The Zoo’s population of domesticated Bactrian camels serve as stand-ins for their critically endangered wild cousins. The herd consists of about a dozen camels, including several born here. Bactrian camels are covered with long, dark brown hair that is shed in warm weather. They have two humps, a long neck and head, small ears, and closeable nostrils. Pads protect their chest, elbows, and knees when resting. Camels usually gather in small herds of up to five females and one male. They can withstand extreme temperatures, and reportedly are good swimmers. Domesticated camels can carry nearly 600 pounds, and travel about 2½ miles per hour. 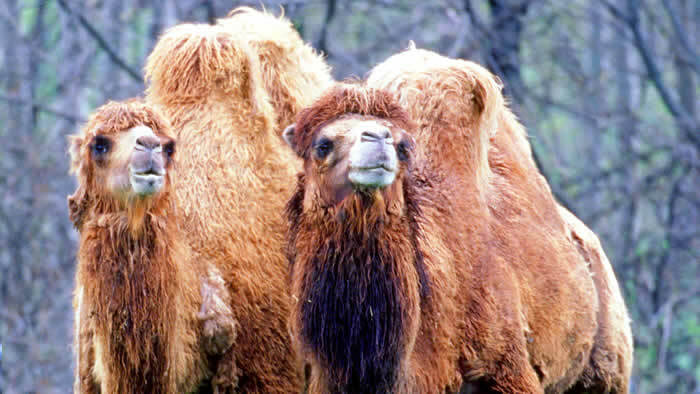 Bactrian camels can drink even salty water—up to 15 gallons at one time. They can go two or three days without water. Bactrian camels eat practically any vegetation that grows in their arid environment. If forced by hunger, a camel will eat fish, meat, skin, and even bones. At the Zoo each camel eats about 13 –17½ pounds of pelleted feed and grass hay per day. Bactrian camels usually breed between January and May. Gestation is 390 to 406 days—more than a year! A single calf is delivered from a standing position. Bactrian camels are one of five mammal species that are communal sucklers, which means the female allows any calf to nurse. Calves nurse for up to two years, are independent at 4 years of age, and are fully mature at 4–5 years. Bactrian camels live 15–40 years in human care.